Reverse Osmosis is the dominant technology in water desalination. However, some critical issues remain open: improvement of water quality, enhancement of the recovery factor, reduction of the unit water cost, minimizing the brine disposal impact. This book aims to solve these problems with an innovative approach based on the integration of different membrane operations in pre-treatment and post-treatment stages. 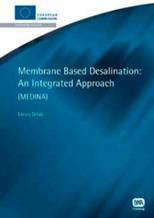 Membrane-Based Desalination: An Integrated Approach (acronym MEDINA) has been a three years project funded by the European Commission within the 6th Framework Program. The project team has developed a work programme aiming to improve the current design and operation practices of membrane systems used for water desalination, trying to solve or, at least, to decrease the critical issues of sea and brackish water desalination systems. In the book, the main results achieved in the nine Work Packages constituting the project will be described, and dismissed by the leaders of the various WPs.